I tend to stay away from 'smoke flavored' products...prefer to add real smoke flavor from the smoking process. That's my thought I don't like the smoke flavored generally. It should work if its probably like Morton's tender quick but with smoke flavor. I used tender quick before I or pink salt. Worked well, like it was already ratioed to salt so not a lot of work just measure proper amount and go. Alright, pulling from the cure today. Going to give it a good rinse then forming the pellicle. Question. Anyone tried leaving it in a drying rack at room temp in front of a fan? I was hoping to smoke today and read that you can form the pellicle in a few hours that way. When should I remove the skin? TIA. I've never tried the fan method. As far as removing the skin, I remove it before the cure when cold smoking. 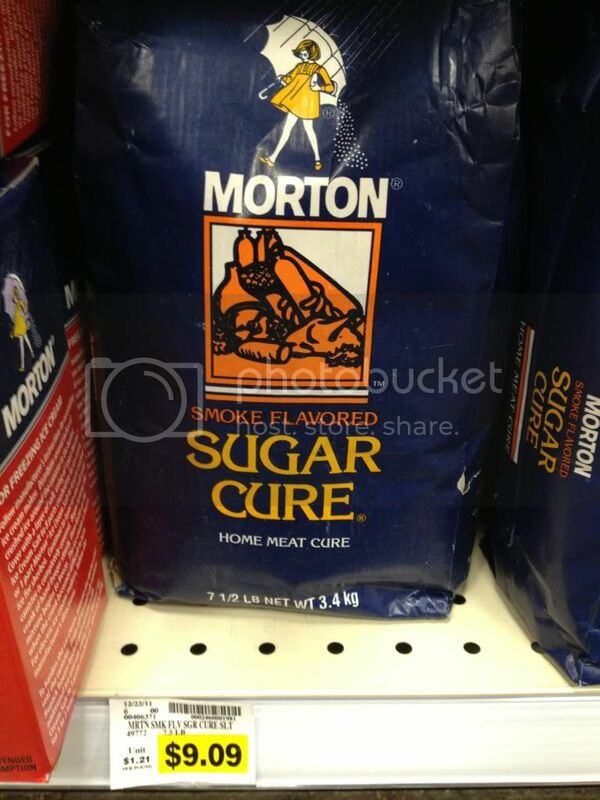 I've never tried it after the cure, but I would do it before the cold smoke. 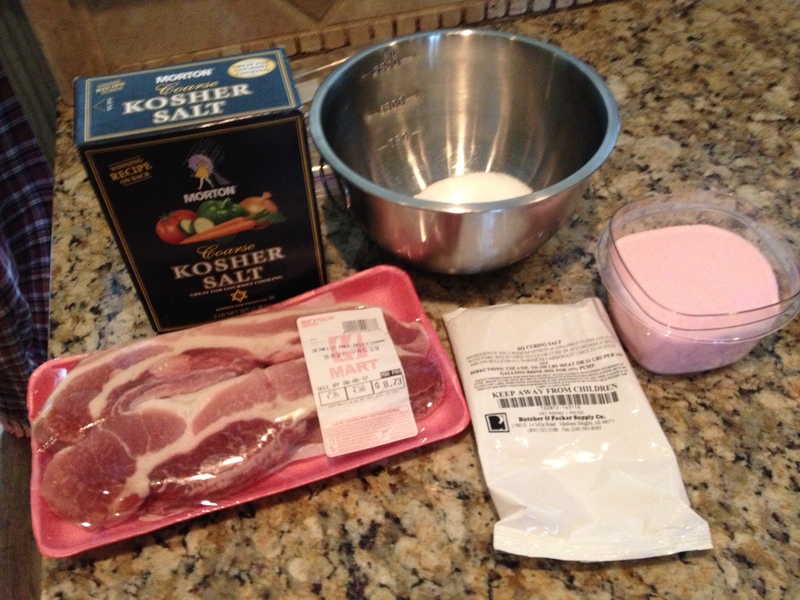 Got my pink salt in and grabbing a belly today for some homemade bacon. 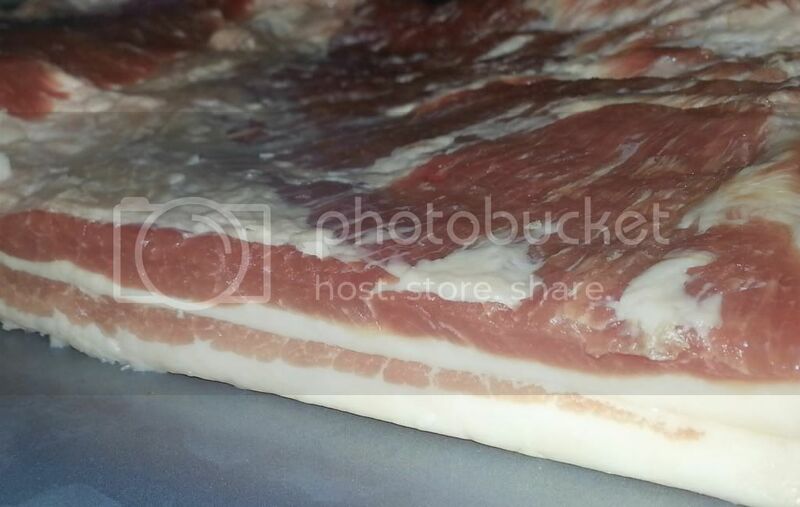 After curing, what temp do you bacon pros usually smoke bacon? I am worried about keeping the temp down for hot smoking less than 200. I cant imagine trying to keep it below 100 for cold smoking. Please help me understand. I have seen posts about Amaze-N-Smoker or whatever. Is that needed? Pink salt arrived Friday, first time curing so here it goes wish me luck guys. I went with 2 tsp pink salt, 1/4c brown sugar, 1/4c kosher salt and pepper corns. I saw the fan method online somewhere like 3 hours. I usually go 24 but I know like pork chops and such form pellicle after about 3 hours in the fridge after a quick brine. Thinking ill go to william Sonoma tmrw and save on shipping and time . . .assuming it is same product? Just make sure it is 6.25% sodium nitrate. I think MQ meant Sodium Nitrite? I am just going to go the normal fridge route. Thanks guys. Will just run an "errand" tomorrow and come home to start the AMS so I can catch the tail end when I get home from work. Thanks for all the help, feedback, and suggestions. Here's what you can do with the skin. Scrape any fat and meat off the skin, leaving only the skin. Using kitchen shears, cut the skin into cracker-size pieces. 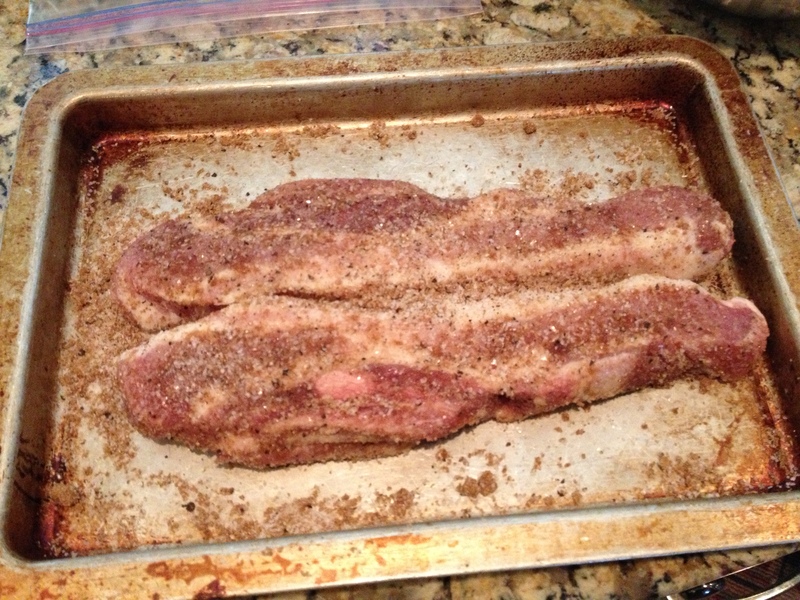 Place the skin pieces on top of a cooling rack in a large sheet pan, and sprinkle them with kosher salt. Cook in the oven or on the Egg @ 300 until the fat is rendered in the bottom of the sheet pan and the skin is golden brown and crispy, usually about 3-1/2 hours. Remove the pan from the oven or Egg and place the skins on paper towels to drain and cool. Dust the cracklings with your favorite rub or dip them into your favorite bbq sauce. @socal griller . . . I believe it's 6.25% sodium nitrate aka time release sodium nitrite. I would steer clear of any fake smoke flavorings in anything. You want the nitrITE for bacon...curing salt #1..don't think that quote was me, but i mistakenly agreed. That was me that mistakenly posted nitrate instead of nitrite. Sorry. Pellicle formed. Today is the day. Freaking work though. Agghhhhhhh. 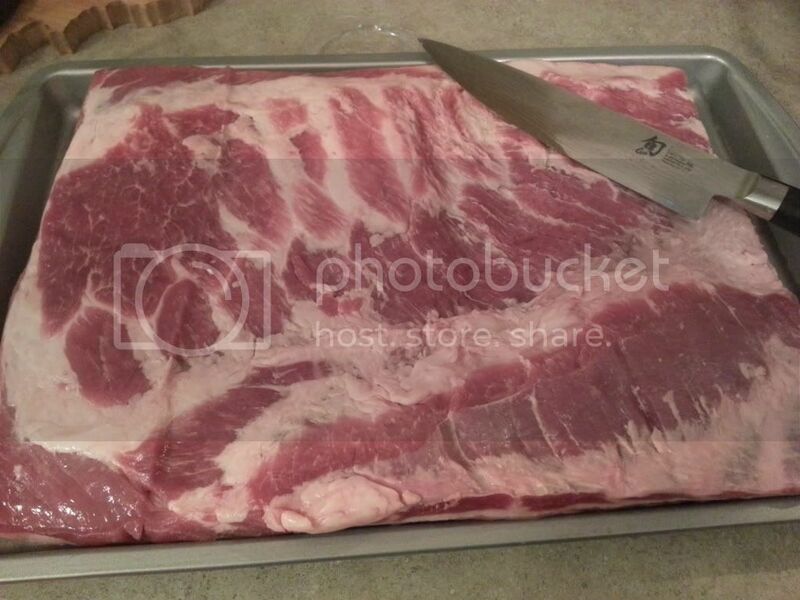 Got a beautiful 8.5 pound fresh pork belly from local farm that has butcher stand on sunday. 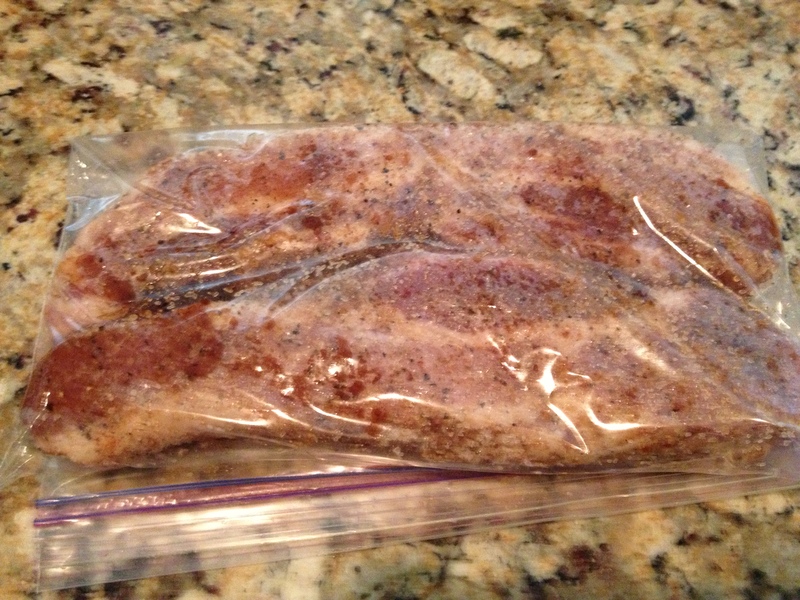 Cut in two and started maple cure with half, used food saver to freeze other half for another day. Cya in 7 or 8 days for cold maple smoke! That is a good looking belly. Good score there. Look forward to the results. I pan fry bacon with whatever non stick skillet I grab--- season CI, le cruset, etc. I prefer oven...375, no wire rack, just on a baking sheet. Nice looking Belly NDG good luck can't wait to see the finished product. Go Bucks! 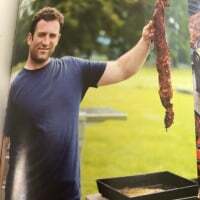 @NDG, what kind of chef knife you have in that pic? I am in the market for one. Its a Shun Classic . . Only few months old but I love it, my first nice knife though. This forum has some experts though so search old postings for the real scoop! AMS went out two hours into it. Relit though and back on. Ambient temp is ~50 degrees. Not sure why it went out. Let it burn for 15 mins before blowing out flame and starting the smoke. Happen to anyone else? Seems to be an ongoing issue with the AMS and pellets. Try sawdust next cold smoke. The same thing happened to me when smoking cheese. I don't know what went wrong. I packed in 3 cups of pellets as directed. The only thing I can think of is that I didn't shake up the bag of pellets before loading. I believe that is recommended to mix some of the saw dust in the bag with the pellets for a better burn. 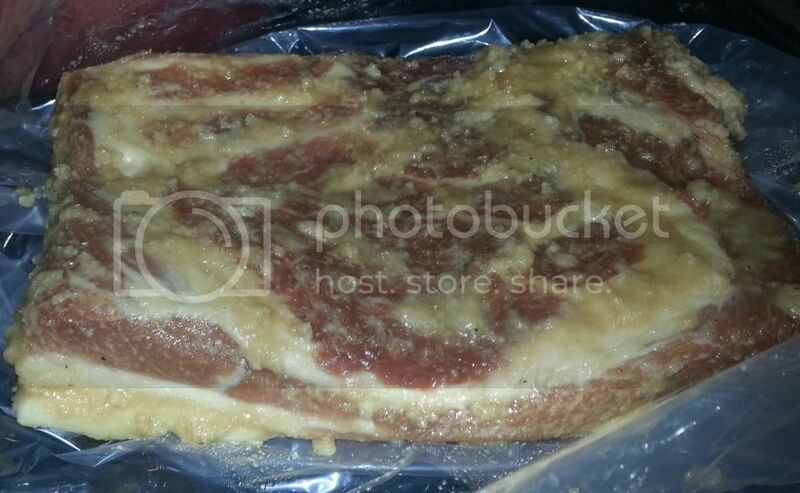 I have 16 pounds of pork bellies curing right now that should be ready this weekend. I'm going to make sure I shake up the bags this time and see what happens. If anybody else has ideas, I would love to hear it? Did you shake up the bag before loading? Oh, I should mention that the temps when I did my cheese was around 20-25F in case that matters. I did get the temp in the egg into the mid 40s and low 50s.